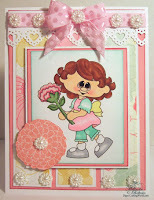 Today’s post is a recap of the activities we had here this week and a couple of cards for our special Wonderful Wednesday Cricut Challenge. So Now on to today’s projects. As I stated before, Wednesday’s challenge was extra special here. We are sharing some crafty love and encouraging everyone to do the same. Each month Madison picks a recipient for her I Feel The Love Project and so she chose the super cute and very courageous Emily. Then one of our Senior Designers shared about a friend of hers daughter Patty who is a spunky and beautiful teenager who is battling a rare form of cancer. So we wanted to share with these two girls! Here are a couple of cards Melin made for them. Here is a close up shot. This card was created using the Bloomin’ Beauty Digital Stamp from PCW. I used the following Copic markers. 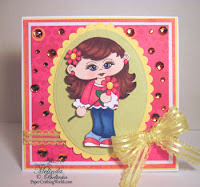 Floral Stamp from CTMH Pemberley Workshop On The Go Kit. 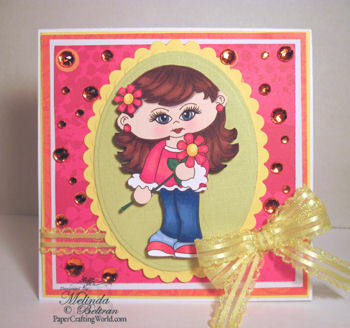 QT Patootie TWEENZ Tori Holding Flower Digital Stamp from PCW. Here is a close up of the coloring. I used some foam dots to give her a little lift. I have yet to mail these out to the girls but will be doing that this week. While the challenge is over on Tuesday night, you have until the end of the month to get your cards to Madison and Kemma. If you need the addresses, please see our challenge post. They are both on there. DIRECT LINK. These are so beautiful Melin. I love seeing your work. Beautiful colors on both.